It has been an eventful year for Switch Ghost and it’s not over yet. We made some new friends in 2016 and had a lot of fun playing in Denver, Boulder and Eldorado Springs. We’ve been working on new material and We’ll be getting busy in 2017 bringing our sound to more Colorado towns. Thank you to everyone that we’ve played with and anyone that has helped propel this monster forward. As mentioned earlier, the year is not over. We have one more show coming up this Saturday December 17 at Three Lions Pub in Denver. This is our last show for 2016 and it’s the pub’s anniversary and ugly holiday sweater party. We’ll be pulling out all the stops and playing some nice long sets. Come boogie with us! Donations for America SCORES Denver, supporting youth soccer, will be accepted at the door in lieu of a cover charge. Any donation at or above $5 will be rewarded with a 20oz pint of Carlsberg! See you soon and thanks for listening. After a cold and dormant spring, Switch Ghost has reawakened. The roller coaster that we’ve been riding has resulted in some new material that we just can’t wait to share with you. We also have some really exciting news coming up at the end of the month. I don’t want to jinx it, so, I’ll just say that it rhymes with schmalbum de-grease and we’ll leave it at that. We are kicking our summer off with two shows at two great venues in Boulder. We will be at Sancho’s Boulder Arrow on June 11 and on the patio at Owsley’s Golden Road on June 23. Both are free shows, so get your drinking/dancing shoes on and come shake something to/at/with us. Music starts at 10pm for June 11 and 7pm for June 23. Of course, you can keep track of all future Switch Ghost events on our upcoming shows section. And, as always, you can listen to us right here on our music page and you can always find the latest live recordings on our Soundcloud page. We’ll see you at the shows! You can vote once a week per email address. These things are generally a simple popularity contest, so please vote early and vote often. Unlike some other voting contests, I can assure you that each one of your votes counts and will not be superseded by super delegates or obscure electoral processes. As always you can find our music right here at switchghost.com/music and live recordings can always be found at SoundCloud. Stay tuned for summer show announcements and upcoming album release news. We had a great month in January with two great shows and two great turnouts. Big thanks to everyone who helped make those shows extra fun. The excitement continues this month as we approach the final mix down of our debut album. We can finally say with confidence now that we are looking at a spring 2016 release date. People have been asking, “What do you sound like?” and “What is album about?” The easiest way to find that out, of course, is to come see us play live. If you haven’t been able to make it to a show yet, you’re in luck. You can always find our music right here on our music page or visit our SoundCloud page for the latest live recordings. If you still don’t know what we’re about, I made one of those silly word cloud thingies (see above) with all the lyrics to the songs from the first album. With three different songwriters, we tend to have a lot of different stuff on our minds. If there’s a central theme, it’s hiding in that word cloud somewhere. We’re working on filling up the calendar for spring, so stay tuned. In the meantime enjoys these posterized shots from the Bohemian Biergarten. Today marks the beginning of our month long birthday celebration. As of this morning, it is Michael Wright’s birthday. Switch Ghost was also born in January and is now 1-year old. We will continue the celebrations through January 24 and 25 for Brandt, Joe and Jasper’s birthdays, but you can feel free to celebrate all month. To help with that goal, we have two very special performances coming up. This Friday, January 8, we will be celebrating Michael’s birthday at the Bohemian Biergarten in Boulder. This is our first Boulder show under the name Switch Ghost and we are very excited to show this town what we can do. Then on Thursday, January 21, we return to Denver’s Tennyson Tap where we will be joined by the very talented Eleanor Frances. Playing music is the best gift we can think to give ourselves for our birthdays. If any of you would like to gift us with your presence at these shows, we would be very happy birthday boys indeed. 2015…The year that spawned a Switch Ghost. We would like to extend our deepest gratitude to everyone that helped make 2015 a great year for the music of Switch Ghost. None of this is possible without the friends and family members that support our music habit in countless ways. Whether its the simple act of tolerating our practices at your house, or allowing us to steal the majority of your husband’s/boyfriend’s free time, we must first thank our lovely wives and girlfriends (and of course, our neighbors) for allowing this madness to continue. Also, to all the friends and family that have come out to see us play live, we literally couldn’t do it without you –after all, the venues don’t like an empty establishment. Thank you to everyone that has made our shows in 2015 a good time, we’ve got a killer year in store for everyone coming right up. So here’s the story so far and a recap of the year that gave birth to the sonic whirlwind that is Switch Ghost. It all began in the summer of 2014 as The Hatter’s Blend was reaching its peak. Drummer Brandt Garrison began trading work-hours as an electrician for studio time at a local recording studio. Just as the band was getting ready to record their debut album and playing some of their largest shows to date, they discovered that they were losing one of the founding members. Eager to record in a professional studio, Brandt and the remaining Hatters, Michael Wright and Jasper Niemeyer, began rearranging the line-up. Michael moved from bass back to his original instrument, the guitar. This allowed him to unleash much more of his songwriting, and suddenly between the three of them there was a flurry of creative activity as they built an ever increasing repertoire of original rock and roll. By the beginning of 2015 they were joined by bassist Joseph Damron and the transformation to Switch Ghost was complete. Joe immediately fit the group’s eccentric blend of styles like a well-placed rug in the dude’s apartment –he really tied the room together. The band assembled a solid set list and began playing out live in spring of 2015. After smoothing out the rough edges with a few performances, once with Verses the Inevitable and once with Highland Ramblers. After making some new friends and gaining some confidence, they were finally ready to utilize those glorious studio hours that Brandt had labored so diligently to acquire. In June they entered The Crucible and began work on what everyone expected to be a simple demo. With Andy McEwan heading up the production, Switch Ghost entered the room and banged out 8 songs over 2 days, live, in as few takes as possible. As a general rule, if a song didn’t work in 3 takes, we quickly moved on to another song. This allowed our humble demo to lay the basis for a proper debut EP that clocks in around 40-ish minutes. Needless to say, we couldn’t be more excited. At the time of this writing, the album is in the final stages of production and is in the very capable hands of Mr. McEwan for the last bit of mixing and mastering. The album is expected to be released in the early part of 2016. Switch Ghost performed one final show of the year on December 29 at the Lions Lair in Denver. There was a solid turnout and a good time was had by all. The other bands on the bill, Hot Sisters and Seems Good, brought down some high energy two-piece rock. Sound man Henry had the mix sounding great, and Switch Ghost played a tight and vigorous one hour set on new years eve-eve-eve. We had a blast and even got some good photos with the help of Ian Wolf and Haley Sinn-Penfold. 2015 was good to us, and if you are reading this, you are one of the primary reasons. 2016 is shaping up to be an excellent year, as well, with our debut recording on the horizon and many shows to come. Stay tuned, January is our birth month (as a band and as individuals), we plan on getting busy. More great things to come, thank you all! Happy New Year! Everyone knows that serious party people party the entire week on New Years. It is important to make sure to properly finish off a year before moving on to the next, everyone knows that. With that in mind, we are pleased to announce one last show for 2015. 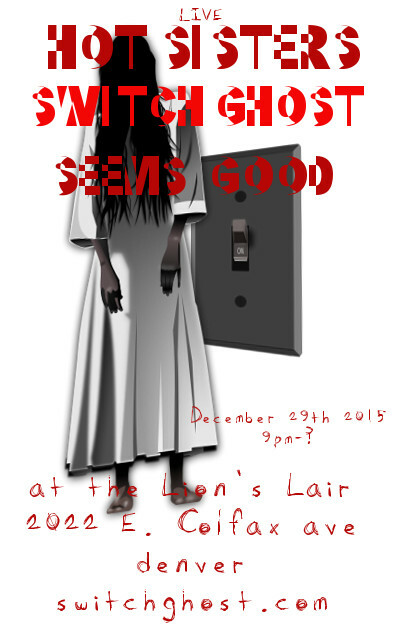 Switch Ghost, along with Hot Sisters, and Seems Good will be appearing at the Lion’s Lair Lounge in Denver on December 29. We have prepared an evening of rock and roll madness, sure to fuel the soul and propel you on your cold winter’s journey through the pre-dawn of 2016. Join us, as we squeeze the last bit of life there is out of 2015. After all, do we really deserve another year if we didn’t finish using this one?